Recently there was a thing at the kiddo's school where everyone had to be pick a country and make some food to share. 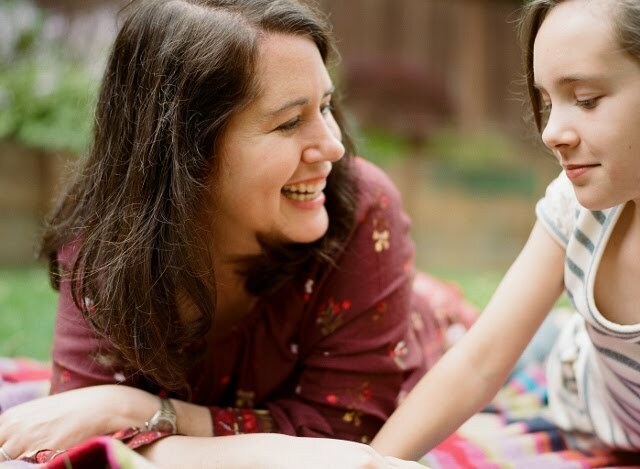 I like food and I like sharing so I totally volunteered to be a parent chaperone. Julia picked Cuba for her country, and we decided to try and find a traditional Cuban dessert, and one of the first things we found were guava pastelitos. 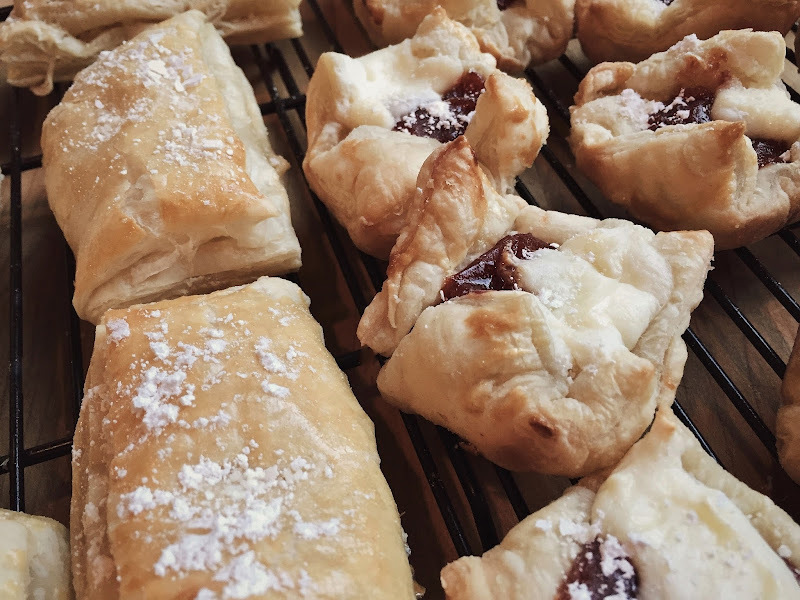 When I saw that the ingredients were basically puff pastry, guava paste and cream cheese, I was like done, we're doing that. Turns out things were slightly more involved (guava paste?? found it at a local Hispanic grocery store. I also saw some at World Market.) and Julia wanted to make coconut, guava and pineapple. I was like, no way sister, choose TWO. So she chose to do guava and coconut. 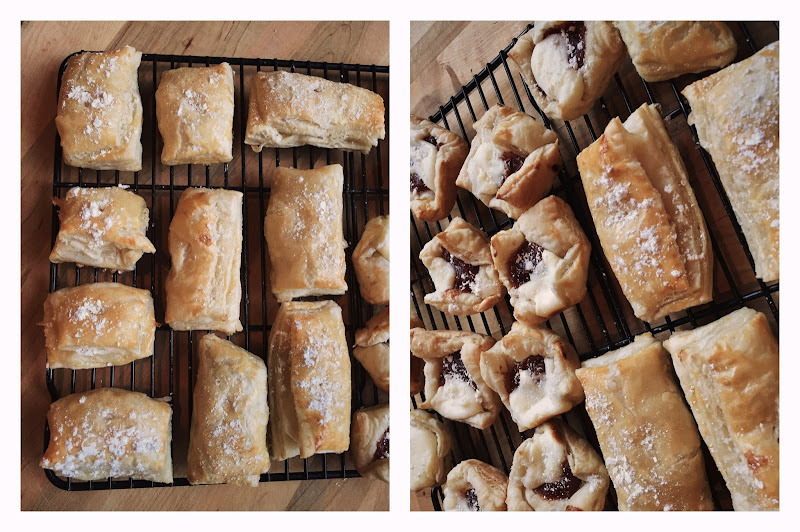 They were both delicious and this was so fun and pretty easy AND don't despair over chasing after guava paste - these would be great with any kind of jam! The coconut filling was super easy and that was actually my favorite - Julia loved the guava. 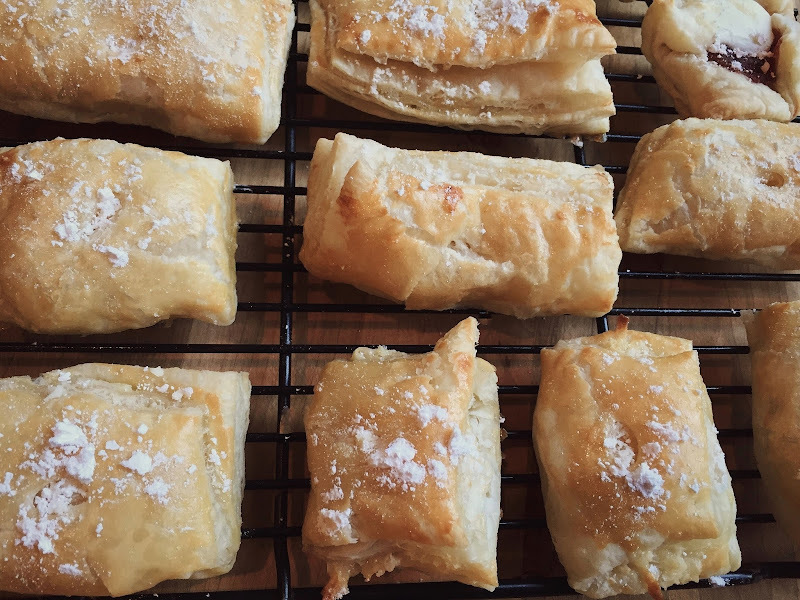 So if you're looking for something fun to do in the kitchen this summer, just remember puff pastry is your friend. You could make turnovers. You could make tiny pies. It makes whatever you do look like so much more work than it actually was. Lightly roll out puff pastry on a floured surface. Cut into 2 and 1/2'' to 3" squares. Lightly grease a mini-muffin tin (or regular muffin tin) with nonstick cooking spray. Press a square of puff pastry into each cup with the edges sticking out. Set aside. In a medium mixing bowl, combine the cream cheese, lemon juice, sugar, milk and salt. Stir until smooth. 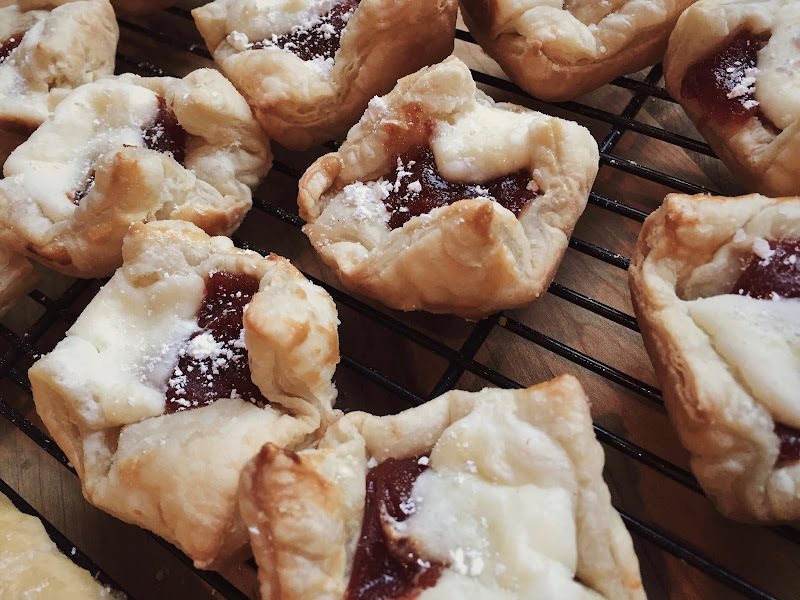 Place a teaspoon of guava paste into the center of each puff pastry cup. Top with a dollop of the cream cheese mixture. Bake for 20-25 minutes, or until golden and crispy. Remove and allow to cool before serving. Add the sweetened condensed milk and water to a small sauce pot and place over medium heat. Stir to combine and bring to a simmer. Add the coconut and cook over low heat, stirring frequently until pale golden brown, about 5-6 minutes. Transfer to a bowl and allow to cool. Place a square of puff pastry in front of you. Place 1-2 teaspoons of cooled filling into the center of each square. Fold in half to create small rectangles or triangles. Use a fork to seal edges of the pastry. Continue with remaining filling and pastry. 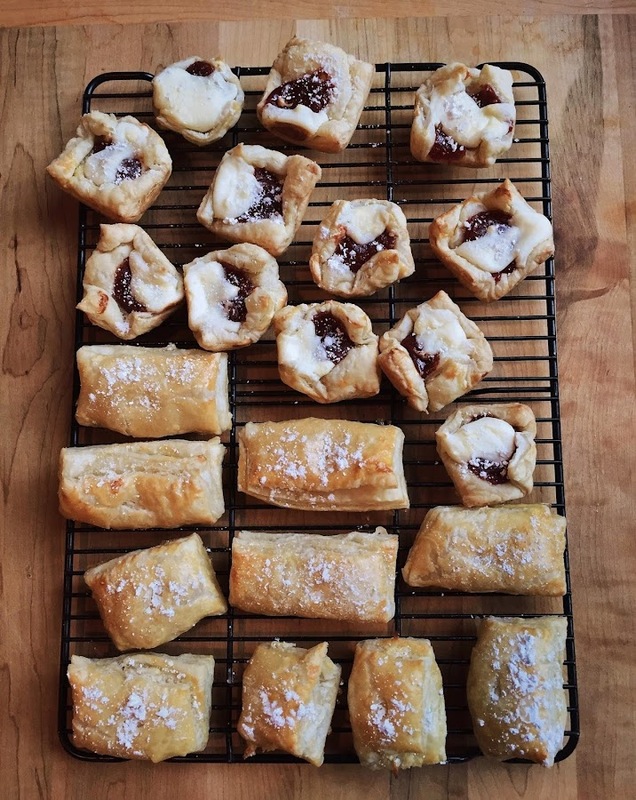 Transfer filled pastries to a parchment-lined baking sheet. Brush the tops with egg wash and sprinkle with a little salt if desired. (we sprinkled powdered sugar) Bake for 20-25 minutes, or until golden and crispy. Remove and allow to cool before serving. ~What do you think, have you ever tried pastelitos before? I had never even heard of these ever in my life. We'll definitely be making them again, especially the coconut. I have never tried these, but now I want to! they were fun! you would love!